I’ve previously written up an overview of SmartThings, now it’s time for a review. This is the home automation hub I use and the only one I have personal experience with. 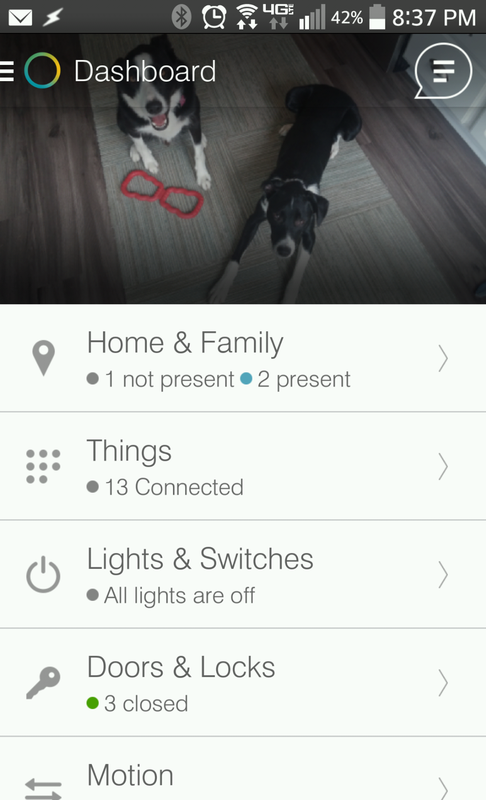 SmartThings is an excellent option for anyone looking to dive in to the home automation space. Considering the openness of the system, the price and the promising growth seen with the Samsung acquisition, the future looks bright for SmartThings. The system does still have some quirks that may detract a few people. While nearly any Zwave or Zigbee device can be paired, it is not always straightforward and may require some Internet sleuthing to get things right. The app is great, but not always very intuitive and is sometimes downright confusing. This seems to be improving though and it is certainly not a deal breaker. While these aspects may tilt SmartThings a little toward the tech-savvy (or at least not tech averse), I think you will have a hard time finding a better option on the market today. The SmartThings Hub is pretty basic to say the least. It’s a somewhat trapezoidal, very light hunk of plastic in a white that makes you think its an Apple router. This hub is pure business. It has no sensors, cameras or even WiFi. It’s meant to plug into your router via ethernet and live there. This is probably its biggest contrast with devices going for an all-in-one approach like Piper or Canary and something to consider if you have a small living space or just want something simple. SmartThings is going to require other devices to be of any value. Pairing your hub is very easy. Your device ships with a code and the entire setup is done through the SmartThings app on your mobile device. Once setup, you are ready to start pairing devices. Like I mentioned above, this will likely be the last physical interaction you have with your hub for awhile. It will go on to live a, hopefully, quiet and productive life plugged into your router. The SmartThings app is (for the most part) the means with which you will run your system. Opening the app brings you to the dashboard. The dashboard. Note, cute puppies for picture sold separately. This is where you can see all your paired devices. There is some redundancy here as you have a “Things” category that lists everything and then items are also split into categories like doors or lighting. At first this seems unnecessary, but after you get several devices paired, it allows you to go to devices that you manually control much more quickly. It’s also from this screen where you both pair new devices and add new apps. I will discuss pairing devices a little more below, but this is where SmartThings can get a little challenging. The apps are all put into categories and while some are very straightforward, “motion” for instance, many are not. While sometimes having these pre-made apps makes things easy and straightforward, sometimes you would just like to select a device and add a scene to it with something like a drop-down menu of available actions. Also, it can be very tricky to set up the same action for different scenarios. Once you get into home automation you realize this becomes important, too, as many alerts are unnecessary when you’re around and vice versa. Once you get the hang of this, setting up most scenes and apps become pretty straightforward. The app also contains the log of all your events when you click the little text box icon (not necessarily the best icon choice in my opinion). You likely won’t look at this often, but it can be helpful if you need to check on anything. Most of your important events will likely be sent to you via push notification and/or text so this just provides a more granular look at that. On the left tab is where you can access the shop, your account info, support and settings. This page has recently gotten a big upgrade that makes it far more useful: mode status and the ability to change it. The Action log and where you can add access the actions (lower right) and can change modes. A list of your current “actions” and where you can add more. The left tab that contains the vitals plus the very nice mode indicator and an easy place to change it. Oh modes, you constantly reminded me that as polished as I thought the app was when I got it and how “easy” everything was, there were still some necessary usability upgrades that needed to be made. My problem was that I knew they existed, I knew how useful they would be, but I couldn’t figure out how to access them. The app conveniently reminded me I was in “Home” mode, but I had no idea how to really change it or how to work with them. When I finally got around to getting a siren, I knew I had to figure it out and eventually after enough searching around the SmartThings website (which has one of the worst search features I’ve ever seen), I got it figured out. Modes and corresponding actions make this system go from doing some neat stuff to being able to making the system an automation all-star. I’m a firm believer that a home automation system isn’t great if you’re having to control it all the time. The whole beauty in automation is not having to think about things. With modes you can control when you get alerts from motion detectors, when a siren goes off, when lights go off and the possibilities are endless. It helps that you can set up actions (opening doors, people arriving, a time, etc.) to automatically change the system into a desired mode. For instance, I have my bedside lamp scheduled to come on every night around 10pm and when my motion detectors have been quiet for a bit and I turn that lamp off at night, it switches my system into “Night” mode. In Night mode, my siren activates and my IP camera now turns on motion alerts–pretty cool. And when I wake up in the morning and let the dogs out, opening my back door automatically puts the system back into Home mode. Where the magic happens. The dialog to connect new devices and add new scenarios/alerts/scenes. The “doors” shortcut. Gives you a quick way to view the status of all threes and provides a shortcut to see apps linked to each. The lighting page. This one not only allows you to see the status of the lights, but allows you to click to turn on and off. Icons are customizable too. So why was it so hard? Well for one, “actions” and modes are separate things though they can be intricately linked and are by default, titled similarly. Modes include home, away, night and built in actions for “good morning,” “good night,” and “goodbye” are included. In essence, the action describes the mode. For the life of me, I couldn’t really figure out to tie the two together. I didn’t want to have to manually change the mode every time I left or every night just to get the desired results. Once I figured out that actions were tucked in to the little settings icon on the “Hello, Home” page of the app–you know, very small under the action log, I was set. Like I said the real power of these is controlling some of your alerts and actions that you don’t want (like sirens) happening all the time. When you first start this will be challenging and less necessary–you don’t really need too much control over a motion detector and door sensor. As you add more and more devices with their requisite notifications and alerts, this becomes both easier to accomplish and necessary to cut down on the noise (both figuratively and literally). Since then, SmartThings has very smartly added a quick way to change the mode in just a couple of clicks (no longer is it tucked in the settings or also hidden on the log page). This makes those every-now-and then actions or scenes much easier to pull off and think about. It also makes you much more aware that they are there. After getting all this figured out I recently set up a “Safety and Security” scene where my nightstand lamp and front porch lights (both GE Links) along with a battery siren will trigger if motion is detected at my front porch when I’m in Night mode. It works like a charm and the way my motion detector is set up, false alarms will be kept to a minimum. Perfect. I’m sorry if this seemed a little long, but I thought it highlighted an area for improvement for SmartThings. It seemed crazy to me that some of the most powerful features you could use for home automation were buried in the app and so hard to figure out. I may have just been an idiot and it took me some time to figure it out, but it represented a big UI/UX gaffe for me. Luckily they seem to be improving this and it is great that the power of this is there. Adding new devices is most of the time relatively straightforward, particularly so if you’re using a SmartThings branded device or one of the more popular 3rd party manufacturers out there (EcoLink, Aeon, Belkin to name a few). The only caveat is that you must be pretty close to the hub to sync for the first time. As most of your devices will be battery powered and mobile, this isn’t a big deal. If you’re syncing a wired switch or outlet, you may run into some issues and have to try and move your hub. I’ve yet to do this, but am hoping that my WiFi extender with and ethernet jack will make this much easier. For those devices that are not as popular, like those from Monoprice, you will usually have to add as a generic device, e.g., “Zwave door and window sensor.” If you need to play around for it, SmartThings has the added capability of really diving in to the guts of the system through the IDE at https://graph.api.smartthings.com/. As with a few other things that aren’t explicit to the novice, you usually come across this after Googling a device you have trouble with. This is a little scary at first, but this is where the developers get to play around and create really cool stuff. I’ll go through this more in depth in a later post. At the end of the day, SmartThings will only be as reliable as your WiFi. Mine is very reliable so this hasn’t presented an issue. The SmartThings cloud seems to be rock solid. I’ve noticed little-to-no downtime and only one “scheduled maintenance” period since I’ve had the device. If you’re looking to use your home automation system as a standalone home security system, it currently doesn’t offer an offline backup. If your power or Internet is out, you’re out. Some of the newer systems offer this as an option and this is a reason we still keep our, unfortunately expensive, traditional home security system around. SmartThings is just getting started. I’ve been very impressed with the progress the team has made on the app in just the last several months. They seem to push updates nearly every month and many are ones you actually notice. The big thing looming out there is how being a part of Samsung will impact the platform going forward. I touched on the emphasis Samsung placed on the smart home in their most recent conference and it has my at least somewhat excited. Most of the focus at the conference was on smart appliances. As cool as those are, I can only get so excited about a connected dishwasher. And these aren’t low cost items…most people aren’t going to spend several hundred dollars to upgrade a perfectly fine appliance just so they can loop it into SmartThings. I’m really hoping that going into 2015 we see more synergy with Samsung’s massive infrastructure–cheaper devices, more devices and better working devices. If you’re looking into joining the home automation space and want the most open platform out there that is easy enough for novices, but powerful enough for pros, it’s hard not to recommend SmartThings. It has its quirks for sure, but I’m not sure if any device in this space doesn’t right now. I’ve been very happy with this purchase and enjoyed learning its hidden tricks along the way. I’m expecting 2015 to be a big year for SmartThings and think you should too. One day after my review, SmartThings lands the #2 spot in Time’s 2014 Top 10 Gadgets List, but…. Alexa, what is the weather today?–First impressions of the Amazon Echo.